Since late 2013, a sharp increase in Kremlin disinformation and propaganda has threatened to upend democratic progress and political stability in Ukraine. The strategy of “hybrid warfare” deployed messaging across Ukraine to stir up fear of being made second-class citizens amongst residents of Crimea, paving the way for illegal Russian annexation of the peninsula and the occupation of parts of Donetsk and Luhansk oblasts (provinces). Since then, Ukrainians live in a propaganda-filled environment where half-truths and wholesale fabrications play on fears, confusion, national identities, and patriotic feelings. Against this backdrop, Ukrainians are becoming increasingly cynical and apathetic about the country’s future. While Ukrainians consume a high volume of news content, barely one in four Ukrainians trust the media, and only 23% cross-check news sources—the most basic form of media literacy. This situation facilitates poor decisions, discourages civic engagement, dampens grassroots demand for transparent and accountable government, and reduces prospects for economic growth. In this context, IREX designed and implemented Learn to Discern (L2D), a “demand-side” response to the problem of manipulative information—an essential companion to “supply-side” solutions such as supporting independent, ethical, and truthful journalism. Citizens must be able to separate fact from fiction and recognize manipulation and hate speech, and they must demand and seek out independent, fact-based journalism. 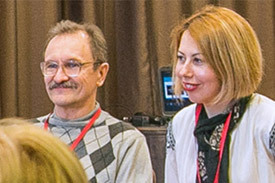 From October 2015 through March 2016, IREX implemented L2D with funding from the Canadian government and in partnership with local organizations Academy of Ukrainian Press and StopFake. Through intense skill-building seminars, L2D reached more than 15,000 people of all ages and professional backgrounds. Remarkably, L2D also reached more than 90,000 people indirectly: direct participants shared what they learned with family, coworkers, and peers. Accompanying public service announcements and billboard messages alerting Ukrainian citizens to the danger of fake news reached an estimated 2.5 million people. In 2017, IREX evaluated the long-term impact of the L2D training by assessing news media literacy skills using a stratified random sample of L2D participants and comparing the results to a control group matched for gender, age, region, and education level. The impact evaluation used an online survey instrument that required respondents to analyze real and fake news stories to examine retention of skills and knowledge over time, as well as self-report their media consumption habits to assess the level to which they seek out quality sources of information. These effects persisted even 1.5 years after participants completed the program. This demonstrates that L2D is an especially effective approach, as prior studies have shown the effects of other media literacy programs wane after one year. 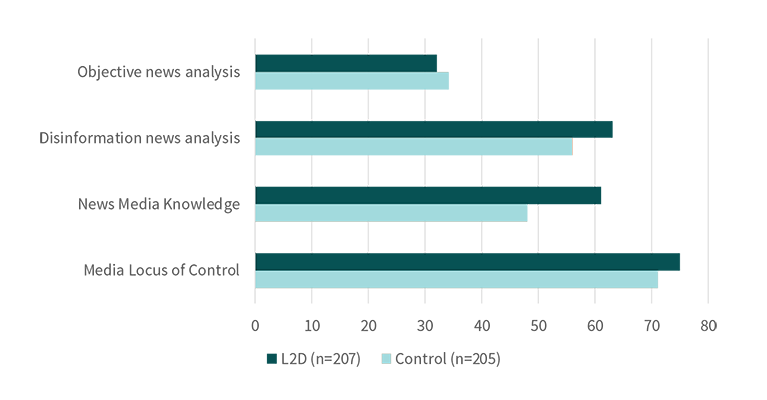 The findings of the L2D impact study make a unique contribution to the media and information literacy research literature. In particular, the development of a task that required the analysis of news stories allowed L2D participants to demonstrate whether they had better news analysis skills than a control group matched for education, age, gender, and geographic region. Can Machine Learning Help Us Measure the Trustworthiness of News?